Barbara Moore, PhD, President, Shape Up America, explains how both baby and mother are negatively affected when the mother is overweight during pregnancy, including risk of disease, complications during birth, and gestational diabetes. Well, this is an area that's very actively being researched, and we don't have all of the answers, but what it appears is that obesity in the pregnant mom affects her metabolism. We know for example that obese pregnant moms are at high risk for gestational diabetes, which is pregnancy diabetes, or gestational hypertension, which is pregnancy high blood pressure. So it shouldn't be surprising that obesity is also affecting the developing baby. We don't know precisely how this is happening, but we do know that the course of pregnancy in obese women is more problematic. There are more pregnancy complications, but also the babies are at risk both for illness and disease. They have a higher rate of mortality when they're born. Often, they're premature. We don't have all the answers. 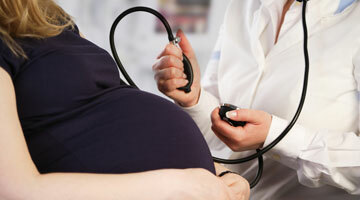 We just know that there are much higher risks associated with pregnancy in obese women.